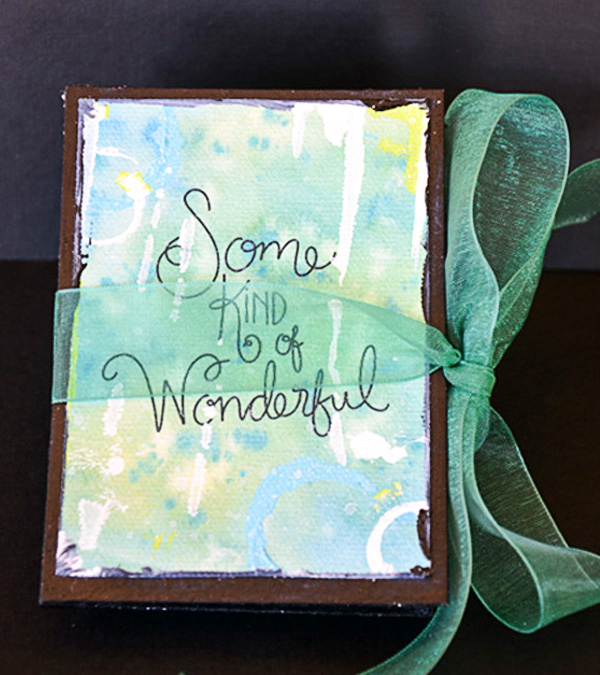 I love ATC cards – tiny works of art and inspiration. Scrap Girls ATC swaps provide an awesome opportunity to share these little gems with creative women from around the world. Whether you are a digital “person” or a hybrid “person”, perhaps this project will inspire you to join in an upcoming swap. You will find links to both the hybrid swap and the digital swap at the end of this post. Lately, I’ve been thinking a lot about the importance of embracing my imperfections. I know its hard to believe but I have a few – lol. Most of us struggle to remember that we are each unique and we are “some kind of wonderful”. I need a daily reminder that despite my flaws I am “beautiful”. I suspect that you can use a reminder too. So with these thoughts in mind, I created a series of ATCs that could be easily displayed. As I’ve shared before, I’m a mixed media artist who combines digital and traditional mediums. This project combines both mediums but you can easily create a finished project with minimal supplies. 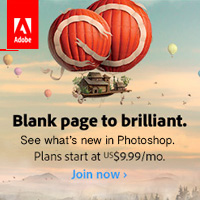 Step 1 – Open your photo editing software. 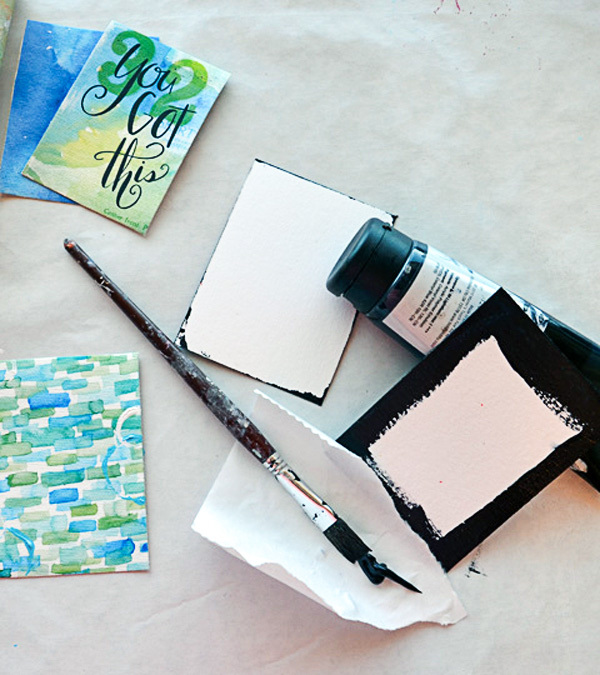 Create a front and back template for your ATC on separate layers (2.5″ x 3.5″). Select coordinating Scrap Girls digital papers and word art. Drag and drop digital paper onto the layout. 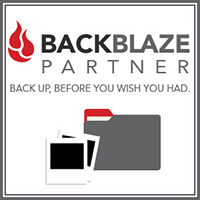 Resize and clip digital paper to front and back layer of the template. Resize and clip digital word art to template. If you are swapping your ATCs you will need to add artist information on the back of your card(s). Tip – I cut my ATC layouts 1/4″ smaller for mounting. Plan the margins accordingly. 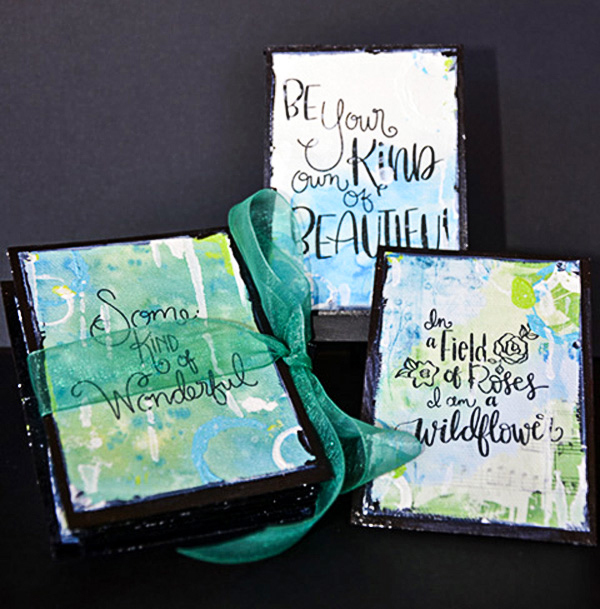 Step 2 – Create ATC holder front and back template approximately 1/4″ larger than finished ATCs (2.75″ x 3.75″). Follow Step 1. Tip – I cut my holders 1/4″ smaller for mounting. Plan the margins accordingly. 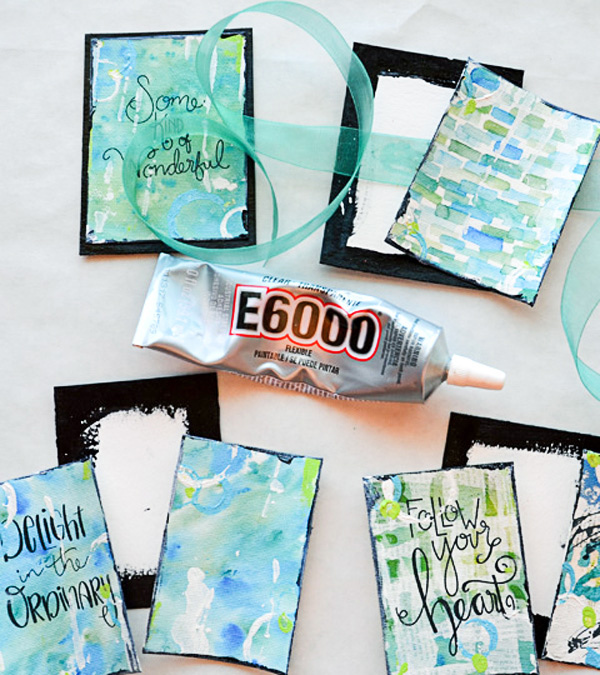 Step 3 – Create a print sheet and print ATCs and ATC holder on printable canvas, mixed media paper (117 lb) or heavy cardstock (80lb). I used printable canvas. Cut ATC(s) and holder 1/4″ smaller than original layout (ATCs – 2.25″ x 3.25″, Holder – 2.5″ x 3.5″). 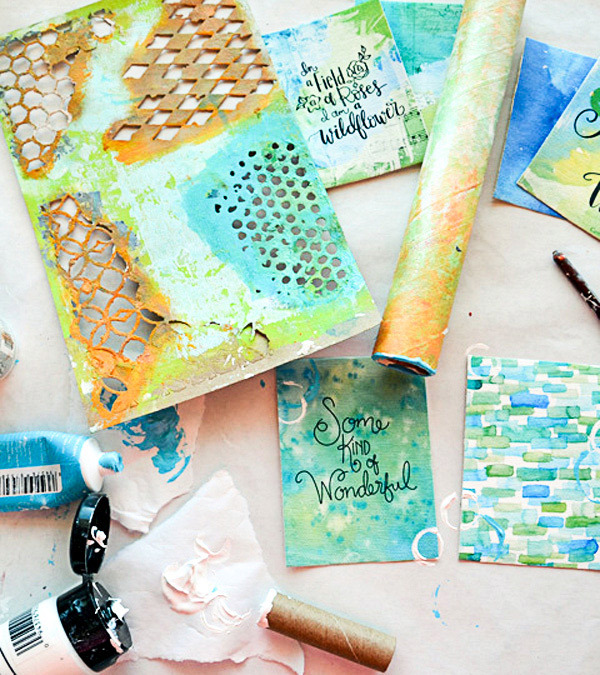 Tip – Using the right paper will make a difference in the finished product. 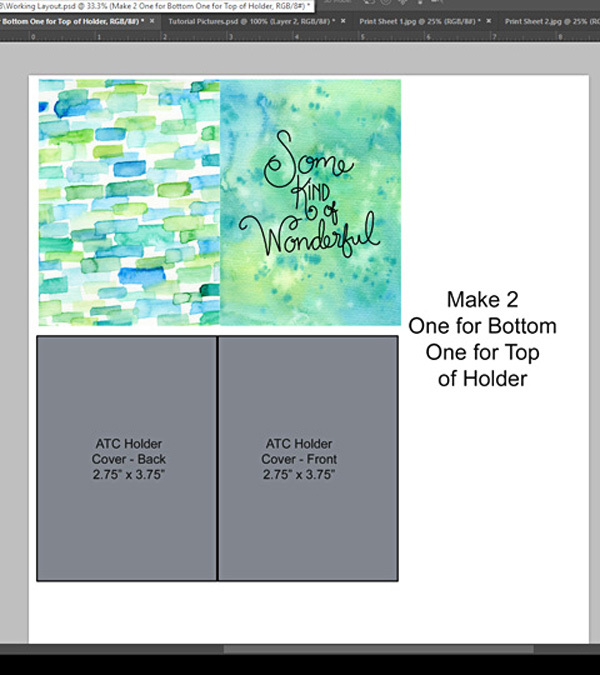 Step 4 – Cut mats from watercolor paper (120 1b), (ATC mat – 2.5″ x 3.5″, Holder cover mat 2.75″ x 3.75″). Paint the front and back edges of the mats with acrylic paint. 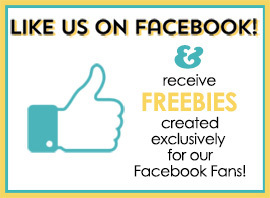 Tip – Heavyweight black cardstock will also work for mats. Step 5 – Alter layouts with acrylic paint, mark making “tools”, stencils, etc. Tip – Be cautious when applying wet medium to layouts printed on inkjet printers. Inkjet printer ink is waterbased and not permanent. 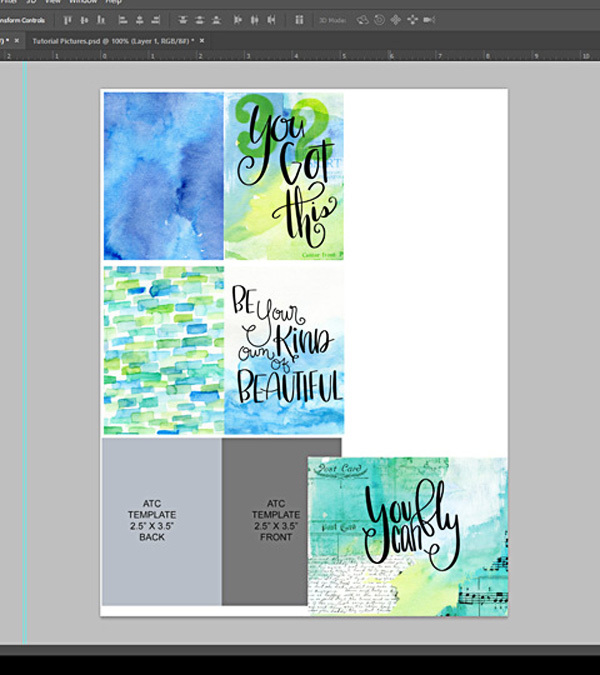 ATCs: Adhere layouts to front and back of ATC mats. Holder covers: Adhere ribbon to one (1) holder cover mat. This is will be the bottom of your ATC holder cover. Let dry if using glue. Adhere holder cover layouts to front and back of holder cover mats. 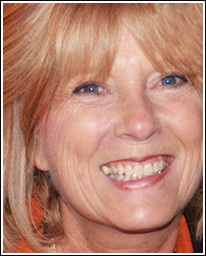 Tip – Using the right adhesive will make a difference. I used E6000 for adhesive since I was working with canvas and watercolor paper. Two-sided craft tape will work with cardstock. 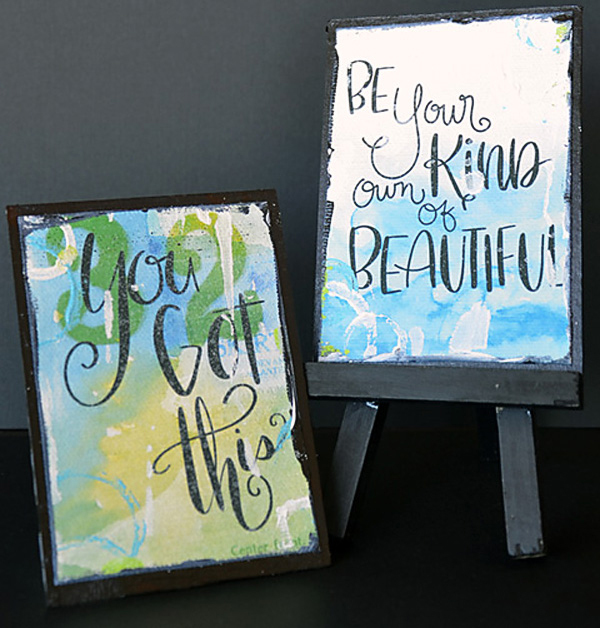 Step 7 – Purchase a small easel(s) to display your ATCs. I bought unfinished wood easels in bulk and painted with black acrylic paint. 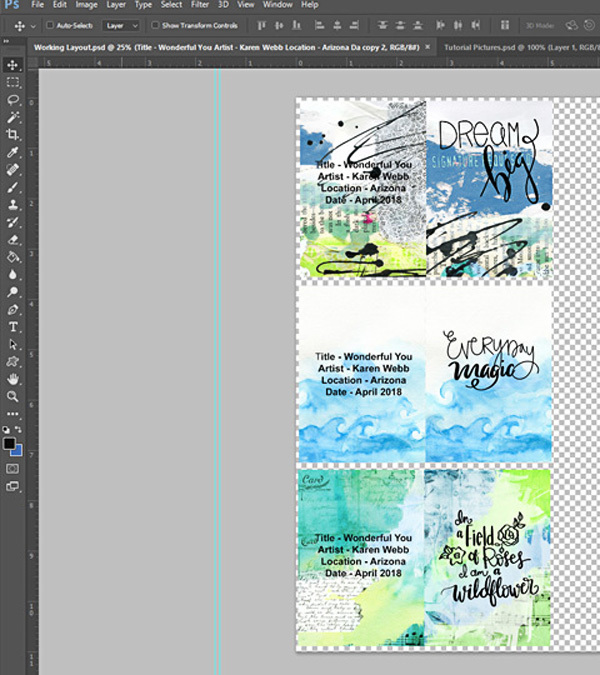 Now that I have my inspiration ATCs done I plan to print and assemble a few extra sets for gifts. Perhaps they will brighten someone’s day. Join us soon for one or both of the ATC swaps. And as always, live each day creatively.